F1 'grid girls' under 'strong review' - how did you vote? 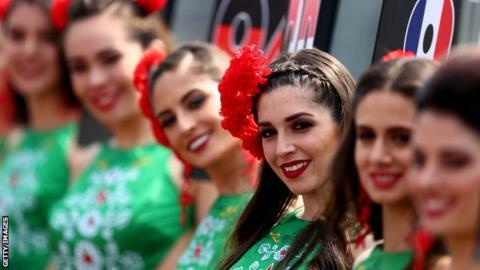 Formula 1's new owners are looking into whether the sport should continue to use 'grid girls'. Ross Brawn, F1 managing director of motorsports, said the use of female promotional models is a "delicate topic" which is "under strong review". "We're trying to respect all parties," Brawn told BBC Radio 5 live. "There's a lot of people respect the tradition of the grid girls and there's people who feel that it has become a bit dated, so we're addressing that." Brawn's boss, F1 chief executive officer Chase Carey, said: "What we need to do is get as many points of view as possible and make a decision right for the future of the sport." 'Grid girls' are models used to conduct certain promotional tasks, usually wearing clothing that bears the name of a sponsor. Among their duties in F1 are holding umbrellas or driver name-boards on the grid, and lining the corridor through which the drivers walk on their way to the podium. Their use has become the subject of debate as social attitudes have changed, and some races have begun to experiment with alternatives, such as using male models instead of female, or children as mascots. We asked you to vote on the issue and 60% of you said 'grid girls' should be part of Formula 1. Carey took over from Bernie Ecclestone as boss of the commercial side of F1 following the sport's takeover by US group Liberty Media in January. "On the list of things I have been dealing with, grid girls wasn't really up there on top, with all respect," says Carey. "Is it something from the past, or is it something distinct that should be part of the future? "I don't think it will be a personal decision for me. I may have a point of view but, when you have a sport, you are dealing with teams and a large eco-system and a large fanbase that is very passionate. There is never going to be a consensus, but a set of views." Carey wants F1 to "engage everybody" and said he would "love" to have a female F1 driver. Red Bull team boss Christian Horner said 'grid girls' "add glamour" to the sport but added: "We've had grid boys and that's been criticised. In Austria we've had children going on to the drivers' trailer and that has been criticised. "You are never going to get it right and we live in a modern society and we have to be open to everything." Horner - who is married to former Spice Girl Geri Halliwell - emphasised that, contrary to the sport's masculine image, women are taking an increasingly central role in F1 in all manner of jobs. "Women play a key role and, borrowing a phrase from my wife, girl power is very strong in F1," he said. "In our team we have a lot of women in senior positions and they are doing a tremendous job. "Look at Claire Williams - new mum and combining that with running the Williams team." Red Bull driver Daniel Ricciardo said he thought grid girls were "pretty cool" and he did not see "any downside". The 28-year-old Australian added: "It's what you grew up with. I guess as a kid even, you see the umbrella girls, the grid girls. It's part of the attraction of the sport." Individual grands prix cannot opt out of F1's use of 'grid girls'. Silverstone boss Stuart Pringle says his personal view is the practice is "outdated", adding "lycra can stay in the 1970s and 80s for me, I don't want any of that tarty nonsense". He acknowledges "very smartly presented, beautiful ladies" have "added a certain amount of glamour" but added: "Our fans and spectators and customers come to Silverstone and think that because its happening at Silverstone it must be Silverstone's decision as they think quite a lot of it is down to us, when remarkably little is on occasion. "There is a perception that this is Silverstone's view but actually we think its an egalitarian world and I don't want my daughter growing up thinking that lycra is what she ought to aspire to." What have you had to say? Kay C: Why, with 2018 just round the corner, is this even a debate? The World Endurance Championship did away with grid girls some time ago and are in no way the poorer for it, let's hope F1 do this too. And as a caveat, as a gay woman who loves motorsport, I love a beautiful woman, but not put on show. Dizzee69: When my girl was born, I was the only male in the theatre. Everyone else; my tertiary-qualified wife, the doctor, specialist, midwife and anaesthetist were female She lives in a country with a female PM and listens to billion-selling Taylor Swift. Her seeing 'grid girls' is not going to ruin her self-esteem and make her think that is the role of women in society. She is free to choose. Kendo: Why don't we ask the grid girls what they want? What if it pays well and they enjoy it? Jordan: Have grid ladies and gents. Problem solved. Or have none at all. Nick Stafford: Nothing wrong with grid girls, or boys. It's just they don't need to be so scantily clad. They can wear traditional dress for wherever the GP is being held. James Speechley: If the grid girls weren't there I wouldn't notice. They simply add nothing to the sport, I don't feel strongly to support or campaign against really. David Price: Surely the answer to that question lies with the grid girls? If they are happy, I'll continue to enjoy the work they do. Emily Warren: It's just demeaning and a barrier to female participation in the sport, suggesting our role is decorative and not substantial. Mark Jones: F1 should do away with grid girls. It has a certain cringe factor in the 21st century. I'd prefer local schools or charities represented on the grid instead. Bonding F1 with local communities.